53937-Starlight ALTAIR Astralpool's floating Oval luminaire, the latest in decorative lights for indoor and outdoor use. Floats on water surfaces and is supplied with infrared remote control with color change modes in 16 different colors. Product gender: Lamps / lighting for swimming pools..
€111.46 Vat incl. €111.46 Vat excl. By buying this product you can collect up to 11 loyalty points. Your cart will total 11 points that can be converted into a voucher of 2.2. It works with a rechargeable battery with an autonomy of 8 to 20 hours, using low power LED technology. The charger is supplied with the product, to charge simply place on the charging port. Battery Working Time (hours): 10/12. Battery Life Span (hours) : 25,000. Charger: Input AC (V/Hz): 100 - 240 / 50 - 60. Charger: Output DC (V): 7.5. Low battery carbon consumption, energy saving and environmental friendly. Extensive application, such as home decor, lighting, bedroom, swimming pool, ballroom and nightclubs etc. Charge with neoteric wireless induction. With aluminum coating, which protects from high temperatures, resistant to explosions. Long life, with high-tech RGB and rechargeable battery incorporated in the lamp. High degree of protection and impermeability, up to IP67. (Not for induction charging plate, adapter or remote control). High tenacity, against deformation, not easily breakable. Charger: AC input 100V-240V 50 / 60HZ, 7.5V DC output. LED quantity: 16pcs RGB LED Luminary waterproof. Battery: 1500 mAh, rechargeable, 10/12 hours of work. Limited warranty: 2 years, battery life: 25,000 hours at 25 ambient temperatures. Also you can press the "off/on" button to turn on or press for a long time to turn off. The LED light will automatically enter the energy saving mode. Brightness control: you can adjust the brightness on the homochromatic selection. 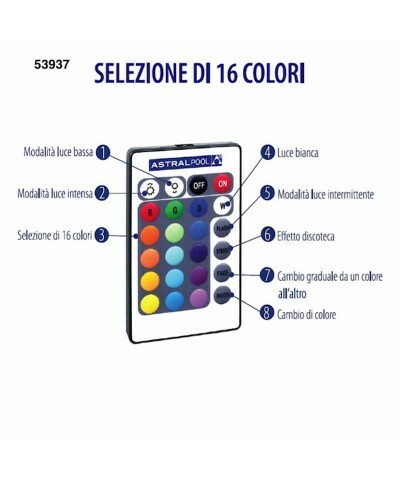 Color selection.16 kinds of colors for your selection, you can select four flash modes. Fully charge the battery of the lamp by placing it on the charging plate for at least 6 hours. Connect the charger directly to the power outlet for charging. Charging: a red light on the plate indicates that the lamp is charging. End of recharge: when the indicator light turns green, it means the battery is fully charged. This product corresponds to the input voltage of the AC100 ~ 240V adapter, for the overall common socket, so use anywhere can be guaranteed. Lamps / lighting for swimming pools. Price €511.65 €511.65 Vat incl. €511.65 Vat excl. PAR56 RGB LED lamp plus LumiPlus Control Motion (remote control) by Astralpool. P. Consumption W (VA): 27 (37). Nominal voltage V (AC): 12. Price €115.49 €115.49 Vat incl. €115.49 Vat excl. 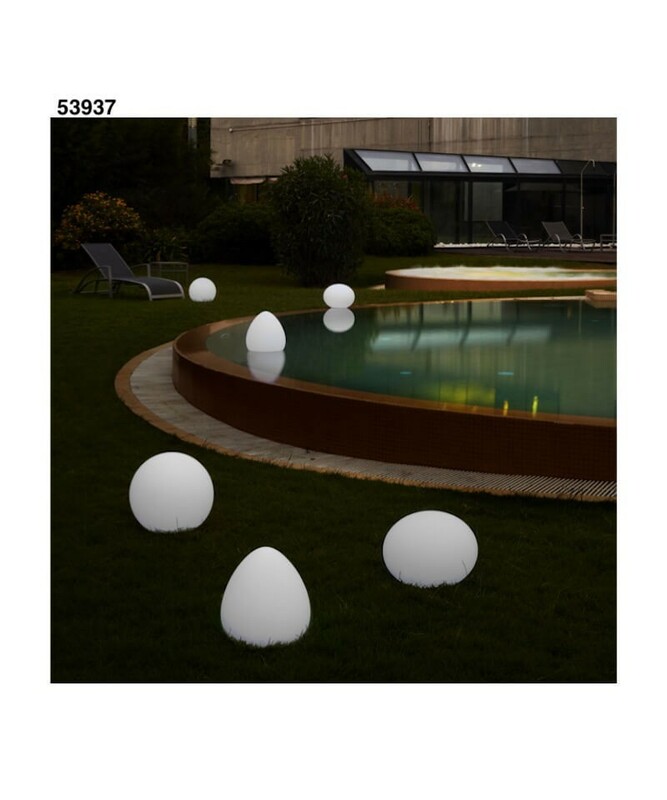 53938-Starlight SIRIO Astralpool's floating Round luminaire, the latest in decorative lights for indoor and outdoor use. Diameter Ø (M): 0,35 . Price €303.94 €303.94 Vat incl. €303.94 Vat excl. 53939-Starlight VEGA Astralpool's floating Oval luminaire, the latest in decorative lights for indoor and outdoor use. Price €141.92 €141.92 Vat incl. €141.92 Vat excl. Par56 white light lamp by Astralpool, a special way to illuminate the pool, on request the PAR56 lamp can be installed with the following emission colors: red, green, blue, warm white or neutral white (for details, do not hesitate to contact us). P. Consumption W (VA): 16 (24).